Storms that soaked California during the first half of January did more than bring tons of snow to Sierra Nevada ski resorts. They also significantly boosted the state’s water supplies. Over the three weeks from Jan. 1 until this Tuesday, 47 key reservoirs that state water officials closely monitor added 580 billion gallons of water, according to an analysis by this newspaper. That’s as much water as about 9 million people use in a year. Nearly all of the major reservoirs around California are now at or above their historical averages for this time of year, swelled by runoff that continues to pour in from brimming creeks, rivers and rising water tables. The combined storage in the 47 key reservoirs, which include critical components of California’s water supply like Shasta Lake, Folsom, Hetch Hetchy and San Luis Reservoir, has expanded from 15.96 million acre feet on New Year’s Day to 17.74 million acre feet now. Each acre foot is enough water to flood an acre of land a foot deep, or 325,851 gallons. “We’re very happy to be where we are,” said Nelsy Rodriguez, a spokeswoman for East Bay MUD. The district’s 10 reservoirs were 42 percent full Tuesday, up from 24 percent on New Year’s Day, and 84 percent of the historical average. But Grimes noted that the district through the year lowers its reservoirs to recharge groundwater, a system that most other Bay Area water agencies don’t have. “There’s a lot of winter left to go, but at this point, our early prediction is that we’ll end the year with good groundwater levels, which means we wouldn’t have any water shortages in the summer,” he said. 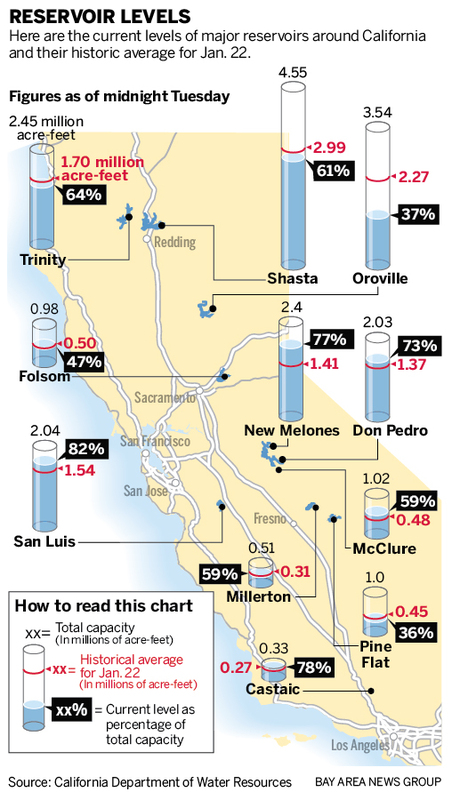 The eight-station Sierra Nevada Index, a daily report that measures how much precipitation has fallen in eight key watersheds near some of the largest reservoirs in Northern California, has so far received 26 inches this winter, Lund noted. The historical average for a whole year is 52 inches. “We’re only about halfway through our three wettest months,” he said. “We have to wait and see what Mother Nature brings us for the rest of the winter. The only thing constant about California’s climate is that it’s so variable.